Some things you go into with low expectations only to be pleasantly surprised by the quality – think the US version of The Office. Other things seem rubbish, and are rubbish – think How I Met Your Mother – but have just enough substance to them to be worth experiencing once in a while. 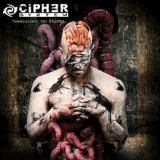 In this metaphor, Swedish modern metal merchants Cipher System are most definitely the latter, playing the sort of electronically-enhanced melo-core that Soilwork and In Flames perfected years ago. You know full well what you’re going to hear before putting Communicate The Storms on. Yet, power to their elbows, the band manage to produce a samey yet somehow interesting album which will keep the ears of any fan of modern metal attuned. I’m not sure how they did it, really, considering that opening track 7 Inch Cut will have fans of In Flames circa 2002 squealing and everyone else wincing. It’s a good deal heavier than Cloud Connected etc, chiefly because of vocalist Carl Obbel’s harsh bellow, but the electronic keyboards and melodic guitars beneath are quite obvious, and by the time the clean vocals arrive for the inevitable chorus you’ll either be in heaven or hell. Ultimately, where the likes of The Stairway struggle for an identity of their own are moments that need to be accentuated if Cipher System want to succeed in a crowded market like modern melodeath. There’s audibly talent at work here, yet some more individuality in the songwriting and risk-taking in the formula would be wonderful in shaping the band’s musical identity. As things stand, there’s not really enough of substance for Communicate The Storms to be worth recommending, but as mentioned, if you find yourself listening there’s just about enough going on to stop you switching over.